Simon is sixteen and gay, and he has only told one person. That person is another student at his high school, who he calls "Blue," because he doesn't know their real name. But Blue is also gay; he wrote something anonymous on a website, and Simon contacted him. They start emailing each other, and they are soon telling each other all about their current lives and their pasts, but in disguised ways, so they don't know each other's real names. Simon can be more honest with Blue than anyone else. Things get complicated when another student, Martin, discovers some of the mails on a school computer and takes a screenshot. Martin is awkward and on the outside of Simon's circle of friends, and in a creepy way, he uses his discovery to pressure Simon to invite him to parties and set him up with a girl who is friends with Simon. Simon half-cooperates with Martin, but also resists as much as he can without running too much risk of being outed. There's a school production of Oliver Twist going on, and Simon has a non-speaking part. Simon and his friends spend a lot of time in rehearsals, and Martin is also in it. At times, Simon could even imagine becoming friends with Martin. But it is always a bit awkward, and almost inevitably, things eventually go south, leaving a mess that Simon has to work through. Both Simon and Blue are smart and funny, and one of the highlights of the novel is their email exchanges. Their relationship includes a lot of self-revelation and confiding, and it moves from friendly to romantic, and then to strained as the issue of revealing their actual names becomes more pressing. Simon goes through a lot in this year, as he comes out first to one friend, then more friends and family, and then more in public. Simon and Blue support each other in their explorations of coming out and exploring their identities and their relationships with others. 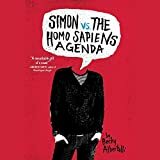 Becky Albertalli, Simon vs. the Homo Sapiens Agenda, has worked as a psychotherapist, and has experience of working with teenagers, and the novel has plenty of insight into how teenagers process their feelings. There's a lot of focus on trust and wondering how well people know each other. It also turns out that Simon feels more comfortable coming out first to a friend who is not one of his closest; it can be more difficult coming out to those who have known you the longest. But this is confusing to the old friends who feel betrayed when they find out they were the first to learn. So the book does a nice job at showing the complications of self-disclosure, especially about sexuality. Michael Crouch's performance of the unabridged audiobook is impressive: he manages to sound young without trying too hard. Albertalli's writing is strong; she is good at dialog and the energy is positive all the way along, although arguably the book could have been edited a little since the final few chapters seem unnecessary. The portrayal of friendships and the family relationships is great, and the few cultural observations about setting of Atlanta, Georgia are nicely done. Overall, this is a great young adult novel about gay teen life.